Namaste: Bamboo Yoga Clothing: Green or Green washed? Bamboo Yoga Clothing: Green or Green washed? Some of the feedback addresses the questions about how environmentally friendly Organic Yoga clothing really is. We decided to carry out some research on the subject and put together a couple of blog posts with our findings. Yoga Clothing can mainly be broken down in to four types of fabrics. Almost all require some form of stretchy material to be blended in such as Spandex or other synthetics. Spandex is made basically from petroleum as are nearly all stretchy clothing substances. There may be some Organic versions on the horizon in the near future but for now all stretchy Yoga clothes including Organic ones include some form of synthetics. Most Organic Yoga clothes limit the amount of synthetic materials to no more than 10% of the overall content. To make the subject more manageable and not to make the blog posts too long we will tackle each type in a different post. 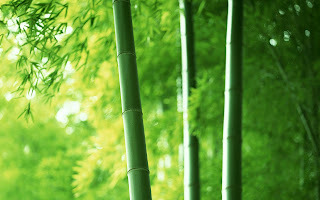 This first post will look at Bamboo as that is the one that is generally being accused of being “Green washed”. Green washing for anyone not familiar with the term means that companies are taking a product that is not really environmentally friendly and claiming it is for the purposes of marketing that product as “Green”. The case against bamboo clothing is pretty simple. No one really disputes that bamboo is one of the fastest growing plants on the planet, uses very little chemicals and fertilizers to make it grow and uses a fraction of the water compared to all forms of cotton. The case against bamboo is based on the production of turning that Bamboo into fabric. There are two ways to do this. One is mechanical where they pulp and squeeze the bamboo with no chemicals. This is fairly easy on the environment but produces quite rough fabric that people, and in particular people planning to exercise in the clothing, tend to find uncomfortable. The second and more common method involves the use of Sodium Hydroxide also known as caustic soda to break down the pulp and help turn in it to the soft cashmere like fabric that is favored by most designers and wearers of bamboo clothing. I have to say that having read many of the blogs and “news stories” that claim that bamboo production using this method is being green washed I really see little or no evidence for this view being produced. The claim is made that caustic soda is bad for the environment. This is clearly true, however what really matters is not what “could” happen to any chemical but what actually does happen. Let’s try and clear up some facts. Bamboo fabric is pretty much all made in China. That is where most of the world’s bamboo is grown. It is used in the production of many products. There are few companies that convert bamboo to fabric and even fewer that then make the fabric into Yoga clothes. Sodium Hydroxide (Caustic soda) is a nasty substance if left untreated. Besides clothing though, it is used in the production of paper in the food industry and in the home as a cleaner. Treated properly it is relatively harmless. It would seem therefore, that if the treatment of the waste products that are used to produce the bamboo fabric are handled properly then bamboo is probably the greenest of all the materials used to manufacture Yoga clothing. I asked our partner (Organic) manufacturers that we represent in our boutique to comment on what kind of systems are in use for the production of the fabric and the handling of the chemicals. “One of the most important parts of the process is all recyclable. We process in a hermetic container where 100% of the chemicals that are used are trapped and contained - not released into our factory, environment or atmosphere. 73% of CS2’s are recycled, 26% are recycled into H2SO4. So those chemicals do not pollute any part of the environment. Each step of the process is watched for many reasons: Company policy, brand commitment, and China's strict environmental ethical standards. We know many of these processing issues are extremely sensitive and we are committed to be a leader in the eco/green industry when it comes to bamboo fiber, but also for the safety of our team/staff. In conclusion, after having weighed up the issue we believe that at the very least the manufacturers offering Organic Bamboo clothing in our boutique (www.downdogboutique.com) do meet the criteria for labeling their products “green” or environmentally friendly. Clearly bamboo is a much better raw material and we believe that every effort is being made to process the bamboo into fabric in what are called “closed loop” systems where little or no harmful byproducts escape. We will be examining what goes into the other three types of fabrics used in Yoga clothing manufacture and will devote a similar blog post to each type, however for now we believe that bamboo is the greenest of the options currently available. We welcome feedback and opinions. If anyone has any actual evidence that bamboo fabric production is causing harm to the environment rather than it “could” cause harm we would be happy to review it. To sign up for our weekly newsletter and see other interesting features and stories about Yoga click the link below. It is simple and just requires your name and e mail address. We do not sell or share e mail addresses. Organic yoga clothing will make you feel comfortable and easy during your meditation session. This will help you breathe through and relax along with a long time working out. It is really a unique way to show that you really love nature. Hope to see more products based on the environment. Thanks for this post !! It is evident that the comfort level during Yoga very much depends on the clothes we put on. Get cotton organic yoga cloth for men and women easily. DownDog Boutique says Hello Minawear! DownDog Boutique says hello to Spacecat!